Today we will design a model that demonstrates the phases of the moon as produced by the light of the (stationary) sun and an earth that rotates (but does not revolve around the sun). The time of day on the earth and the phase should be represented as well as the position of the moon in its orbit about the earth. Distances and sizes to not have to be scaled.Review the material in the video links and the text/image web links. 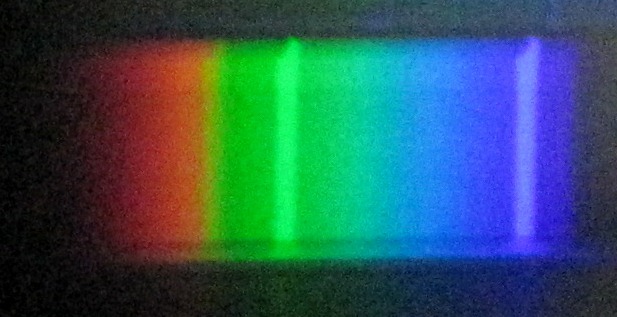 New we will observe the spectra produced in class. Review the links below to help you think about what you are seeing. Light is the main source of all information that astronomers use to develop theories (explanations) of what happens in the sky. Understanding properties of light is essential in understanding many ideas that are a fundamental part of science–from the stars to photosynthesis (our topic after winter break). Photos taken with Ipad through spectrascope (thus the limited resolution).